This 14k white gold engagement ring has a total of sixteen round blue sapphires arranged in four diagonal lines on the shoulder. 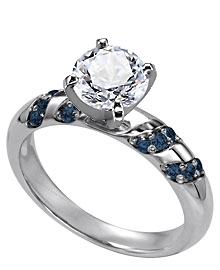 This is a very attractive ring that lends itself to a variety of center diamond shapes. You choose the center diamond from Danforth's inventory.